Just the mention of cutting stainless steel may send shivers down your spine. Most engravers are too timid to work with this material and will shy away from the opportunity. The objective is to make engraving stainless steel agreeable and take the mystery out of the metal. Once you work with stainless and feel confident, you will get opportunities for very profitable jobs that other engraving shops will pass up. There are many reasons that stainless steel is selected for certain applications. It is very durable, corrosion resistant and will not contaminate other materials. It will not react with most chemicals and is resistant to moisture. This is why we see it used so heavily in food processing plants and hospitals where a reaction or corrosion would destroy most materials. Applications include containers, control panels, switch and legend plates, signs and elevator panels. There are several large manufacturers and sub-contractors that specialize in the engraving of elevator panels. These can range in size from a few square inches to the entire interior of the elevator cab. Over the years I have been asked several times by engravers about the techniques for cutting stainless. The first question I ask each time is, "did you select the material or was it provided to you by your customer?" More often than not, the engraver had no idea what grade of stainless he was asked to cut or what grade he should select. Usually the material has already been provided and little is known about its engraveability. If you can get the specific information about the grade or can recommend or purchase the material yourself, you will be much better off. You will be able to find sheet stock stainless from a local metal supply house. Check the yellow page listings or contact a local machine shop for information. There are too many grades of stainless to mention here. We will focus on those that have the characteristics we desire for engraving. When you are selecting stainless from a local supplier, let them know the application and that you are looking for a "free machining" metal. The grades of stainless steel are broken down based on the machinability of the metal. Different grades will cut differently due to the alloy content of the metal. Stainless steels are high-alloy steels and have superior corrosion resistance to the carbon and conventional low-alloy steels because they contain a relatively large amount of chromium. Traces of other metals are used to change the machinability as well as other properties of the material. Grades of stainless steel are designated by a numbering system. There are 400, 300 and 200 series stainless that can be easily engraved. Stainless steels have machinability ratings that can be compared to other common metals. The chart to the right shows the relationships of various metals. A metal is used as a standard and all other metals are measured against this standard. 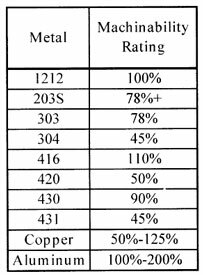 In our chart, #1212 free machining grade carbon steel is used. This represents 100% machinability. It's important to note that other metals may be used as a standard and there are other versions of the rating that may differ slightly. The chart is for reference only. A common aluminum used in manufacturing is #6061. It is measured for a rating against #2011. #6061 will have a rating of 70-80% based on this standard. If you are the curious type or plan to do a considerable amount of metal engraving, you may want to invest in a well know book used by the machining industry. The Machinery's Handbook covers all aspects of machining including mathematical formulas, mechanics, material strengths, properties, measuring equipment, tool making and machining operations. This book is largely used by mechanical engineers but much of it applies to engraving metals and it has a wealth of information. Your experience with other materials will tell you that stainless steel is hard. You would notice this not only in cutter wear or breakage but in the noise you hear when engraving. Cutting the hard metal causes a considerable amount of vibration and this is one of the reasons you may experience more broken cutters during engraving. Additionally, as the cutter wears, the vibration increases and the engraving results will become poorer. You will see more burrs along the edge of the cut and breaking a cutter is more likely. The chance of breaking a cutter is likely so plan to keep extra cutters available. This can be helpful if you need to send some of your cutter inventory in for sharpening. If you have never deep cut metal you will not appreciate the benefits of the collet spindle. When cutting stainless steel, this is one of the most important tools. You can get by without it but the chances of having broken cutters increases dramatically. The reason is that the long drop in cutter you normally would use will have play between the tool shank and the spindle shaft. The movement of the tool sideways in the shaft causes the problem. This slight play is enough to cause serious vibration when cutting. The collet spindle with a split collet will grab the cutting tool vary close to the work area. This extra rigidity will allow for deeper cuts and less chance of cutter chipping or breaking. I do not recommend cutting stainless steel with a small lightweight engraving system. The forces exerted on the mechanics and motors may be too great for the design. You may not be able to detect these forces but they will have an impact on the finished cut. It would be wise to check with the equipment manufacturer before accepting a large project. One of the items that determine the success of your engraving will be the choice of cutting tool. With a collet spindle you will have more options available to you than the traditional single fluted engraving tool. You may consider a 2-4-flute tool designed for machining metals. If you do not have these tools or the job is straightforward and you want to stick with engraving bits, then a quarter round may be a good choice. The quarter round offers good clearance for the removal of the chips during cutting and the reduced surface area helps to minimize heat buildup. Half round cutters will work as well and are considered stronger for the application. There are two schools of thought about selecting the right cutter material. Some people prefer high-speed steel while others prefer carbide. I do not recommend high-speed steel unless you have a cutter grinder available for sharpening. The carbide will chip more often but you will get considerably more characters from the tool before the need to resharpen. Avoid small tip sizes if possible; the strength of the tool will be compromised. I try to stay in the range of .015 or greater. Also, get the tool sharpened specifically for stainless steel. The cutting edge angles will be greater which will also add needed strength to the tool, about 45-degree. When the cutting angle is increased you will notice that the definition of the character is affected. When cutting deeply this will become more apparent. The inside of the characters such as the letter A, E or V will lose some of the detail. There is a compromise here that must be taken into consideration. Unless you are taxed with the chore of cutting out (through) a piece of stainless steel stock, you will probably only engrave to a depth of .010" -.015" deep, just enough for paint filling. I recommend that you do not use your engraving system to cut out the plate outline or shape. Try to purchase the finished plate to size from the material supplier. A depth of .010" doesn't sound like much for engraving. It's certainly enough for paint filling. What you will find during stainless steel engraving is that to get the cleanest cut and reduce the chances of damaging a cutter, you will need to do multiple passes. Multiple passes can be set up manually by adjusting the spindle micrometer or by setting the depth in the system software. If you adjust manually, you will be nose riding on the surface. This will probably cause some scratches in the metal and the plate will need to be polished later (You may be able to polish the metal using a Scotch Brite pad. Rub in the direction of the existing grain to hide or eliminate the scratches). If the depth is set via the software, you will be non-nose riding. This will eliminate the scratches but depth control over the entire surface may be difficult. If the plate is large, set your surface in the center of the area you plan to engrave. Setting the surface at the home or upper left-hand corner of the plate may give depth variations that are unacceptable. If possible, check the quality of cut and hardness of the material by performing a test cut on the back of the panel or into a scrap piece. This can help you to get the proper spindle speed as well as feed rate for the X and Y-axis. When cutting a new material, start with a shallow cut first to “test the waters”. I would try a .002-.003" cut to determine how difficult penetrating the material may be. You can always take a deeper cut in the second pass, maybe .005-.010". If you must go deeper, you may consider a cleanup pass (finishing pass) at the end. For this a .001" or a .002" cut is adequate. This will clean up the sidewalls of the character and remove any small burrs. It's important to remove as many burrs as possible before paint filling. Remaining burrs will only give you trouble when you try to clean up the painted area. The clean up pass also gives the cut a more polished finish and helps to remove the tool marks left behind during deeper cutting. Cutting Speeds commonly known as "speeds and feeds” require some explanation, especially as they relate to engraving metals. Many times when we cut plastics we are not aware of the minor forces applied to the cutting tool or engraving system. When we cut metal, we can immediately see the differences. Cutting stainless is especially tricky and starting with some basic knowledge will help. All of the motion of the engraving system comes into play and is magnified when we cut deeply into plastic or into metals. The spindle speed for stainless steel can vary and is usually based on the depth of cut and the diameter of the tool. The larger the tool diameter, the slower the speed. This is true if we select one cutter type (single flute) as an example. If we change to a multi-fluted tool, we can generally increase the spindle RPM. This is just a rule of thumb. Obviously the more cutting surfaces we have the greater the RPM we can achieve. More cutting surfaces will chew up more material quickly. This directly relates to the speed of the X and Y-axis as well. If we can take shallow cuts then we can move through the material more quickly. We may also be able to move more quickly if we are using a smaller tool, however, there is a point where this process is reversed. You can see that if we move too quickly with a small cutter we may break the tool. It’s good to remember that the rate at which you plunge the cutter into the material will also affect the finished look. If you plunge too quickly, you may fracture or break the cutter tip, especially on those of small sizes. Try reducing the Z-axis feed rate if your system will allow it. Also, you may set a greater delay or dwell in the Z-axis to allow the cutting tool to come up to full RPM before moving in the X and Y direction. Many systems offer this feature and control in either the hardware or in a software setting. There are no practical ways to know the proper settings due to the wide range of variables. A test cut will be more than helpful since we are trying to achieve the cleanest cut in the least amount of time. Engraving into stainless steel will produce friction and heat. These will break down the cutting tool and cause an unacceptable finished cut. Using a coolant or lubricant will help the process. If you do not have access to a cutting fluid or tapping fluid, substitute a thin layer of 3-in-l Oil. Some lubricant is better than none at all. All-purpose oil will do. You can expect the cutting area to smoke if taking a deep cut. Don't be alarmed but be prepared to reduce speeds if the cutter or engraving system appears to be straining to do the job. Adding a little cutting fluid as you go can be helpful. Cutting stainless steel is a great way to increase business profits. Taking on the work that other engravers in your area will avoid may bring you new clients and additional jobs. Stainless steel can be cut once you understand the properties of the metal, what tools are required and how to set up and approach the work. Make engraving stainless a goal for your business and you will be able to tackle any project.